This is a list of women who have made noteworthy contributions to or achievements in mathematics. These include mathematical research, mathematics education,:xii the history and philosophy of mathematics, public outreach, and mathematics contests. Maria Gaetana Agnesi wrote one of the first calculus textbooks in 1748. She was offered a professorship by the Bologna Academy of Sciences, making her the first female mathematics professor since antiquity, but it is unknown whether she accepted. Alexandra Bellow (b. 1935) has contributed to ergodic theory, probability and analysis. Jennifer Balakrishnan, American number theorist who solved the "cursed curve"
Yvonne Choquet-Bruhat is a leading authority on general relativity and is known for existence results in a variety of physical theories. In 1984 she made an influential study of supergravity. Ingrid Daubechies is known for her Daubechies wavelets. Philippa Fawcett gained international fame when she obtained the top score on the 1890 Mathematical Tripos at Cambridge. These planar shapes with the same spectrum, discovered in part by Carolyn S. Gordon, gave a negative answer to the old question "Can you hear the shape of a drum?" The Gray graph, the smallest cubic semi-symmetric graph, was discovered by Marion Gray while she was working at AT&T. Ancient Greek Egyptian mathematician Hypatia was the subject of many literary interpretations in the 19th and 20th centuries. 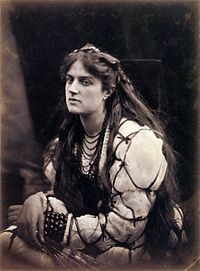 Here, she is portrayed by Marie Spartali in an 1867 photograph by Julia Margaret Cameron. Sofia Kovalevskaya is known for her contributions to differential equations, and gives her name to the Cauchy-Kovalevskaya theorem, the fundamental existence result for analytic partial differential equations. Olga Ladyzhenskaya proved the existence of long-time solutions of the Navier-Stokes equations in 2+1 dimensions. Ada, Countess of Lovelace wrote the first computer program, an algorithm for computing Bernoulli numbers on the Analytical Engine. Emmy Noether has been called "the greatest woman mathematician of all time". In the early 1920s she developed the modern formulation of ring theory. She is also known for a result in the calculus of variations known as Noether's theorem, which relates symmetries to conservation laws. Gail S. Nelson (1959– ), American mathematician, textbook author, and editor-in-chief of the MAA "Problem Books"
Emmy Noether (1882–1935), German researcher in abstract algebra and theoretical physics, named "the greatest woman mathematician of all time"
In 1678, Elena Cornaro Piscopia became the first woman to earn a doctoral degree. Lacking any formal training, Marjorie Rice conducted a systematic study of pentagon tiling, discovering four of the fifteen known types of tiling convex pentagons. Daina Taimina's crochet illustrates hyperbolic space. Karen Uhlenbeck is a leading expert in partial differential equations and has worked on a variety of topics related to mathematical physics. ^ "Profiles of Women in Mathematics". Web Archive of The Emmy Noether Lectures. Association for Women in Mathematics. Retrieved 19 March 2019. ^ Grinstein, Louise S.; Schafer, Paul J. Campbell, eds. (1987). Women of mathematics : a biobibliographic sourcebook. New York: Greenwood Press. ISBN 978-0-313-24849-8. ^ "Maria Gaetana Agnesi". Retrieved 19 August 2015. ^ a b Alexandrov, Pavel S. (1981), "In Memory of Emmy Noether", in Brewer, James W; Smith, Martha K (eds. ), Emmy Noether: A Tribute to Her Life and Work, New York: Marcel Dekker, pp. 99–111, ISBN 0-8247-1550-0 . This page was last edited on 19 April 2019, at 20:28 (UTC).